This afternoon I walked to Woolhampton to check the water level and it appears to have dropped by 3-4 inches since the last visit 7 days ago. However the current still looked very fast. We’ve also been speaking to some of the local boaters on how to navigate through Woolhampton as it appears to have the potential to either embarrass us or even damage Waiouru. The following screen dump from Google Earth gives an idea of what we face. Based upon the information provided and looking at the terrain they current plan is to cruise to the downstream swing bridge mooring and tie up Waiouru. 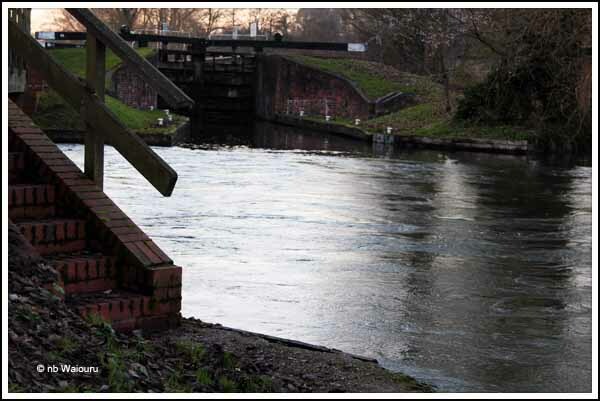 Jan will then walk to the lock and prepare it for entry by emptying it and opening the gates. I will wait on the boat. She will then open the electric swing bridge before returning to Waiouru. I will release the stern mooring line and she will then release the bow mooring line. 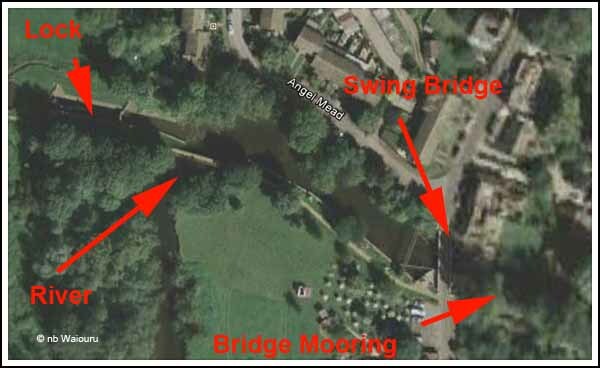 I will navigate through the swing bridge and then up the centre of the river towards the lock. The local advise is to keep the power on and point the bow towards the junction between the river and the left edge of the lock approach. The force of the current from the river will then push the bow of the boat into the lock approach. Whilst I’m doing this Jan will close the swing bridge and walk to the lock and close the gates behind Waiouru. However our plans to slip our mooring and head west were dashed today when an email was received from CRT advising the River Kennet and the canal were both dangerous due to flood waters and boater were advise to “stay put” until the end of January. Oh well…. we’ll wait! The problem with the sat-dome wiring has been resolved. Today I placed the multimeter across the pos and neg terminals and measured 12v. Then the sat-dome was switched whilst the multimeter was still connected and the voltage dropped to just over 1v. Back at the node end of the wiring I cut off the old ends of the wire and remade the connections to the terminals. It didn’t fix the problem so there is a defect/fault with the node output card. To confirm that I moved the sat-dome cable connections to another pair of node terminals and reconfigured the software. As a consequence the sat-dome now has power. Actually, we received an email from Mark Zimmerman of Atlantis Marine (the UK distributors for Empirbus) suggesting I check the node terminal and he was “right on the money”. Mark subsequently emailed us to advise Atlantis Marine will send out a replacement card tomorrow at no charge! I hadn’t even contacted them so that’s damned good customer service! A very poor internet connection tonight hence the brief post! 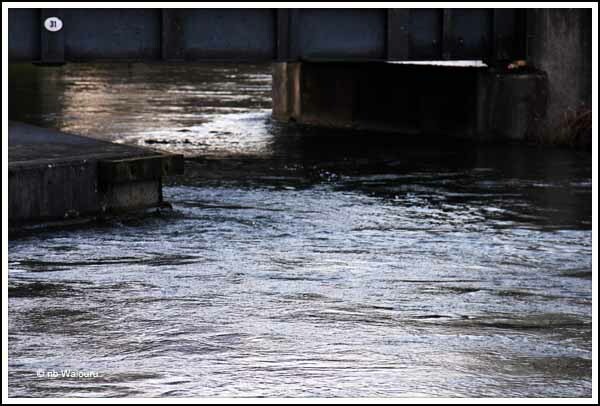 CaRT have issued an advice telling all boaters that due to flood waters and flow on the K&A they should "stay put" until the end of the month. Your instructions seem to miss out enabling the bow thruster. Although it should not be considered normal to use the bow thruster for regular cruising there are times when it can be very useful. It’s less embarrassing to use the bow thruster in difficult circumstances than to hit something hard. You also need to practice using it on a few occasions when you don’t really need it so it becomes second nature to use it in an emergency. I've already practised one winding without the bow thruster when I failed to realise the on/off button had to be pressed longer to activate the controls :-) I won't be shy about using it because that's why it's there! You almost need an extra crew member at Woolhampton. We were lucky to have a boat to share with, but the previous evening I had seen a couple act just as you suggest, and in accord with waterways instructions. However in the time it took for the crew member to walk back to the bridge, open the bridge, and for the boat to come through, some berk coming the other way had shut the lower lock gates and refilled the lock, thus denying the recommended run at the lock across the current. Obviously they either missed or ignored the signage at the lock cautioning them about the need to open the bridge before departing the lock! Hopefully there won't be much traffic when we pass through! I think we may be at cross purposes. I was talking about heading up the lock having come through the bridge first. You are told to empty the lock, and leave the bottom gates open, then open the bridge, and then bring the boat through the bridge and head straight into the lock. Of course it may well be that I am having one of my regular memory senior moments. I understood your comment. My reply was directed at the "berk" who failed to read the signage at Woolhampton Lock. If they had read the instructions/advice then they would know to check the bridge before closing the gates and emptying the lock!